This entry was posted on Friday, October 26th, 2018 at 10:29 am and is filed under Opinion, Opinion, Letters to the Editor. You can follow any responses to this entry through the RSS 2.0 feed. You can leave a response, or trackback from your own site. Really? Norma and Ralph Hernandez? These two are about as crazy as the president. Don’t they know that the president didn’t actually write that response himself. One of Trump’s many assistants wrote that response. Trump’s signature is not real either, it is a stamp. Gees, I thought the Herald would have, at least, called in a hand writing specialist to validate Trumps’ signiture . . . . the specialist would have told you in a matter of seconds that the “signature” was nothing more than a stamp. As someone who worked in DC as an intern for then-U.S. Senator Pete Wilson, and used the autopen machine to sign letters that were approved by a top staffer, to be sent to constituents, usually in response to letters from them, I can say that most likely it’s not a stamp. But, rather his official signature written using an autopen. Whether or not President Trump actually read the Hernandezes’ letter, someone on his staff in a position of authority did and authorized the letter in response. As a side note, I only saw Senator Wilson’s real signature once, during the four months I was an intern in Fall of 1985, and out of all 26 interns in the office, I was one of three who had regular contact with him, as one who worked in Admin, and one of two who drove him around. Letters of a more personal nature to people he knew or such as birthday wishes to people turning 100 years old, were signed by his secretary using his name. (I had to laugh once when I saw her do that because it looked more like his official signature than the autopen!) The one time I actually saw his signature was when he signed for the parking at Dulles International Airport after I had picked him up late, one night and drove him to his home near Capitol Hill. 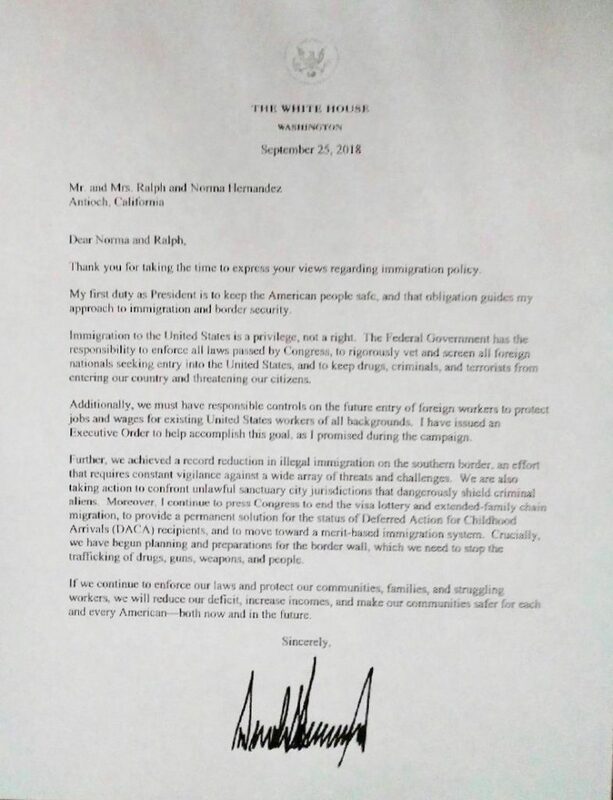 Perhaps, and most likely, Ralph and Norma Hernandez aren’t the only ones to suggest that idea to the President and his staff. But, the bottom line is he proposed pretty much the same idea and it demonstrates that he and his staff are listening to the American people who write. But, even if President Trump’s signature on the letter was from just a stamp, it was stamped there with permission (maybe by a low-level staffer or intern, like I was) under the authority of someone who has it to be placed and mailed out on White House letterhead. Wow what a nutcase would say! What proof does Ju-lie have to back up what she claims? Even her name has a “lie” in it (Ju-lie). We do support President Trump’s effortts to stem the tide against these thousands of unauthorized immigrants invading America and trying to impose their wills upon us here. Why should they dictate to the U.S. who and what we have to accept from other countries’ residents? We don’t and will not. Just what gives them the right to get at the front of the waiting lines for entry without taking a number and meeting the established requirements? Ju-lie should appreciate that President Trump is trying to keep America safe and financially strong, but obviously does not care. 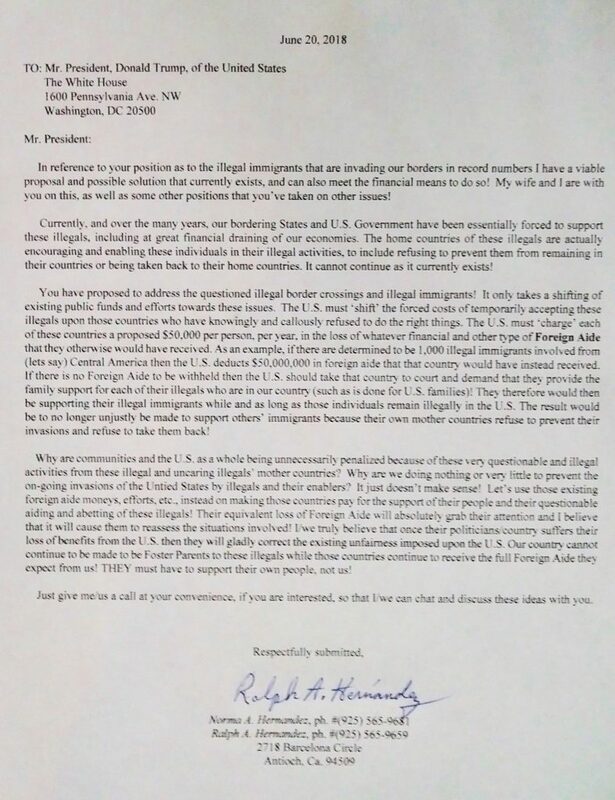 It is an honor that the President has included our ideas/suggestions in his immigration policies, layed out his intentions, and clearly said the other countries’ financial Foreign Aid from America has requirements for them to meet, or else. There are hundreds of millions of dollars at stake. America must not be merely as their Santa Clause of money gifts! Ju-lie and they others like her are entitled to have differing opinions but to just attempt to destroy and condemn moving forward is insanity at its best. They need to have themselves checked for possible mental issues they may not even realize. Then again it could be just some drug-infused delirium or ticks in their psych. A lie is a lie, and Ju-lie needs to submit her assumed proof of what she claims. I believe that her personal undisclosed agenda may be contrary to benefiting our community and just her and her associates to realize with more taxes. She needs help, obviously. I am willing to see her proof and consider it. Otherwise I am moving forward, thank you very much! It’s a nice letter and I’m glad you’re proud to have received it. We received a letter from the President too; it was a different subject but we were just as proud, felt just as important, and believed that however the response letter came to us, it was by authority of the President originally.